What a tough read, this one was. Still, compelling enough to keep me going. June has it bad. Her mom’s been dead for years, which is tragic enough. But her stepmom makes it even worse. She’s an evil stepmom in the most horrible way. There’s abuse, both physical and emotional. The saddest part is that her dad is oblivious to everything. Through it all, June retreats inside herself to escape. A good story, both sad and hopeful at times. Parts of it were hard to take, but it is what it is. Every reader has a select group of those authors, writers whose newest releases are automatic must-reads. Each book is different, of course, but every new story must be read as soon as it comes out. Chevy Stevens is one of those authors for me. From the very beginning, with Still Missing, to the latest, That Night, her stories have not let me down. This latest offering is no exception. Like most stories of this genre, everything begins with a bang. And then it quickly spirals downhill from there. When three young girls are able to finally escape their abusive father, it seems as if their lives might finally take a turn for the better. But of course it’s not to be, as one tragedy after another befalls them. Now, eighteen years later, secrets from the past threaten to rise to the surface. The fragile peace they’ve managed to craft for themselves is in danger of being upended as long-buried (literally) secrets bubble to the surface. And if it seems like my description is ambiguous and vague, it was meant to be. This is one of those stories where you don’t want to give too much away. It’s best enjoyed by going in without too much of a clue as to what it’s going to be about. And it’s far too easy to turn a book review into a summary. So I’ll leave it at that. When I was kicking ideas for this review around in my head, the first word that came to mind was implausible. And I don’t mean that as a criticism at all. But then as I thought about it, I realized that the same could be said for any of Chevy’s books. And that hasn’t stopped me from enjoying any of them, this one included. The characters are so strong, so relatable that it doesn’t even matter if the storyline is far-fetched. The author makes you care about them, forces you to keep reading to find out how it’s going to end. And there are so many twists and turns that you’re never truly quite sure what’s going to happen. Just when you think you’ve figured it out, it goes in a completely different direction. So grab this one and settle in for quite a ride. 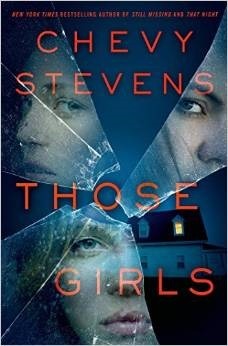 And if this is the first book you’ve read by Chevy Stevens, add the others to your list! Young adult novels are all the rage these days for readers of all ages. Almost every topic has been covered, from the inevitable end of the world to bullying to love gone wrong. This first novel by Mary Jennifer Payne is both similar but different enough from others to make it worth reading. Just as fifteen-year-old Edie is beginning to settle into a somewhat “normal” life, she and her mom, Sydney, must leave their home once again. Almost everything gets left behind, even Edie’s beloved cat, Peaches. She understands the reason they must flee yet another home, but that doesn’t make it any easier. Still, she’s a strong girl who goes along with her mom’s new plans willingly. However, when Sydney doesn’t come home after working her first shift at a new job, Edie fears the worst. Has their past caught up with them? Should Edie trust the authorities to help find her mom or is she utterly, completely on her own? This was a quick, engaging book that had me sitting down to finish it in one evening. The author pulls you in from the moment Edie and her mom go on the run and holds you captive until the very end. It’s easy enough to guess that they’ve been victims of domestic abuse, most likely at the hands of Edie’s father. But there’s still enough of the unknown to make it an intriguing story. The characters are both likable and entirely believable, which is not very common in young adult literature these days. It’s also a fairly safe read for teens with just the hint of past and future violence. Add this one to your list of debut releases from promising new authors!